From top editors to neighbors on the street, we at Canary are often asked, “What Fringe shows should I go see?” And it’s a fair question — besides FringeArts staff and the artists themselves, we’re the ones who know the ins and outs and tiniest details of every single Fringe show. We’ve seen the production images, watched the trailers, read (and often created) the artist interviews, and practically memorized the Fringe Guide from front to back, so we’re more than happy to make recommendations. Here are our top picks for this year’s festival. Let us know in the comments what you’re most excited to see! The nuns of Jo Strømgren’s The Convent, with their “nonsense language” and battles over scraps of bread, have been stuck in my mind since FringeArts presented the work in the 2006 Fringe Festival. In 2008, he worked with local actors for The European Lesson. Norway’s Strømgren is back this year with his dark humor and highly physical theater, and this time it’s a tea bag in a society of coffee drinkers that sparks the tension. Somehow the ridiculous situations and faux languages of Strømgren’s shows work to create something seemingly simple at its start yet expose a more complex world — and an unforgettable theater experience. 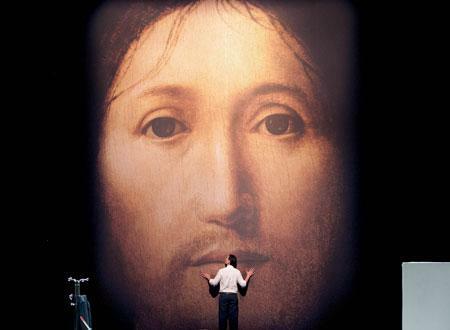 I’m always on the lookout for the Fringe’s most experimental, most out-there, most challenging production — last year it was Charlotte Ford’s Bang, and this year it’s On the Concept of the Face Regarding the Son of God by Italian director Romeo Castellucci. This is not an easy show to watch — on the surface it’s about a man caring for his dying father, and all of the very visceral daily traumas that go along with that process. But the question that Castellucci asks us — how do we find faith in our most acute time of need? — is one that I think is universal for all audiences regardless of religious background. I have a feeling that this show’s emotional shelf life will extend far beyond the curtain call. Very excited for Nichole Canuso Dance Company’s preview of The Garden during FringeArts this year. I’ve been anticipating this new piece since Nichole’s idea was chosen as one of the first Knight Arts Challenge winners back in 2011, and now four participants at a time will be able to take a first peek at how it will all come together. The Garden takes place in the Power Plant basement in Old City (a favorite venue for Fringe performances) and features the music of Michael Kiley and James Sugg. In a few months you can come back to see the finished work when it premieres in November. After missing out the first time they staged the show, Pig Iron Theatre Company is giving me the gift of a second chance by remounting Pay Up. The show condenses the entire experience of the Fringe in one performance — the hustle to make it to the best shows, the race against time, and the unexpected element to everything. This year, I’m not going to miss it! The eerie story of The Ballad of Joe Hill, presented at the Eastern State Penitentiary, will have for a backdrop what I think is the one of the most haunted, evocative historic spaces in America. ESP’s remarkable acoustics are perfect for the creepy percussion and ringing union songs of this production and should make for a chilling and thought-provoking night of theater.